Box pleats are one of the most treasured details in fashion design. They can be adjusted to different sizes; the wider the pleat, the more fabric gets folded over and the stronger the effect of each pleat. 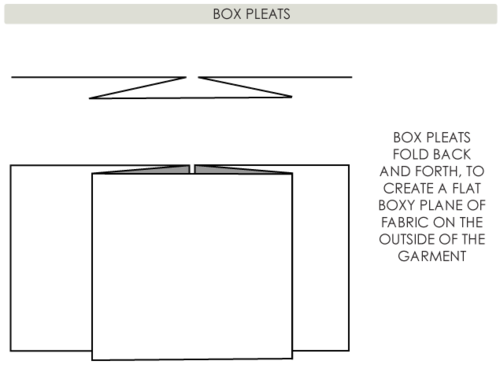 I often incorporate box pleats in my design work. And this dress is an example of how the pleats can dress up a garment. I needed a dress for a formal afternoon event. I bought a nice medium-weight fabric in burgundy and black. The top of the dress meets two box pleats at waistline. The eye goes directly to these 3" pleats - they opened up away from the waist and provide a wonderful drape and movement to the bottom of the skirt. The view shows you how box pleats work from the side. The fabric is flat and close to the body but the fold still creates interesting design detail and visually elongates the body. On the body, I inserted a long dart to shape it along the spine curve. As on the front, the back has two large box pleats. I very much enjoyed wearing this dress to the event! The dress was comfortable and the silhouette made me feel well put-together. The pleats just add such classy feel to it!